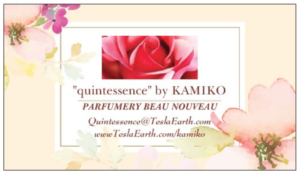 The secret of the Quintessence approach to Harmonic Fragrance Composition and it’s use, is derived from an ancient lineage of Sumerian, Egyptian, and Japanese Alchemical Arts [Formulae derived from Olde-World-Wisdom], coupled with a series of polyamorous relationships that include several of the world’s most coveted, antique [heritage-based] Damascene perfume-roses. Quintessential Theme-Sets are comprised of 5 individually bottled PRIMARY FRAGRANCES. Each of the 5 PRIMARY Compositions are comprised of HARMONIOUS NOTES that fit the THEME. For Example: Bright Floral morning notes and residual balsamic or musk-like notes, require adjustments for formal luncheons. These afternoon layers will require additional refinement as the evening draws near. In summary; the fragrances ones wears at a morning brunch will require adjustments for a business luncheon, and a sudden invitation to a romantic dinner demands quick changes in attire and more importantly in the scent one projects in each instance. Understanding how to make best use of the 5 PRIMARY compositions of any given THEME, sets the stage for success at every level throughout the day and into the wee hours of the morning! !